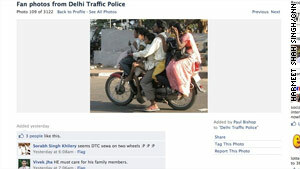 Delhi's traffic police have set up a Facebook page, enabling commuters to file complaints against bad fellow drivers. New Delhi, India (CNN) -- Lanes often dissolve into meaningless white lines painted on roads. Slow three-wheeled taxis splutter right in the middle of overpass bridges as a chaotic mix of tailgating motorcycles, scooters, cars, cycle-rickshaws, vans, trucks and buses overtake each other aggressively. New Delhi is struggling to discipline its reckless road users. And it has now undertaken a digital venture to rein them in -- via Facebook. The city's traffic police have set up a page on the social networking site, enabling commuters to file complaints against bad fellow drivers, with still images and videos serving as photographic evidence. In a little over two months, the account has registered more than 18,000 fans. Residents have uploaded over 3,000 pictures showing defective license plates, bikers without helmets, overloaded transport, wrong parking and officers breaking rules. Video: What's it like to drive in India? With more than 6 million vehicles zigzagging its roads, the city has been issuing up to 10,000 tickets a day for traffic offenses, police say. On their website, city traffic police list more than 40 road offenses punishable with a fine. Now, about 700 notices have been dispatched solely on the basis of complaints posted on the Facebook page since its launch in May, said Satyendra Garg, a joint commissioner of New Delhi's traffic police. Inspectors used license-plate numbers in the pictures to track down the alleged offenders, he explained. The Facebook initiative, officers say, is part of what they call their department's mission objective to encourage public involvement in traffic management. Authorities expected users would mainly be alerting them about systemic flaws, such as faulty signals, bad street-lighting and broken roads. Instead, fans have turned their cameras on others creating danger on streets. An image, for instance, showed three children and three adults riding one motorcycle. Another had three men hanging out on the rear of a cargo auto-rickshaw. Traffic officials now have staff dedicated to monitoring the Facebook posts. They, however, are aware that the cyber forum they have opened to regulate road use is prone to abuse. Concerns, too, have been raised over privacy issues, Garg said. Yet, he insisted, citizens have a right to report violations. "As a concept, we welcome it," Garg said. In any case, account users could be prosecuted for posting false complaints, he said. But no bogus claim has come to notice so far. Already faced with a manpower crunch, the city's traffic police say they now have more work to do than before after their Facebook endeavor. "Certainly it has increased our workload," Garg said. "But at the same time it has also facilitated traffic response."